Discussion in 'Discussion (AdGuard for Windows)' started by chromatinfish, Mar 21, 2014. 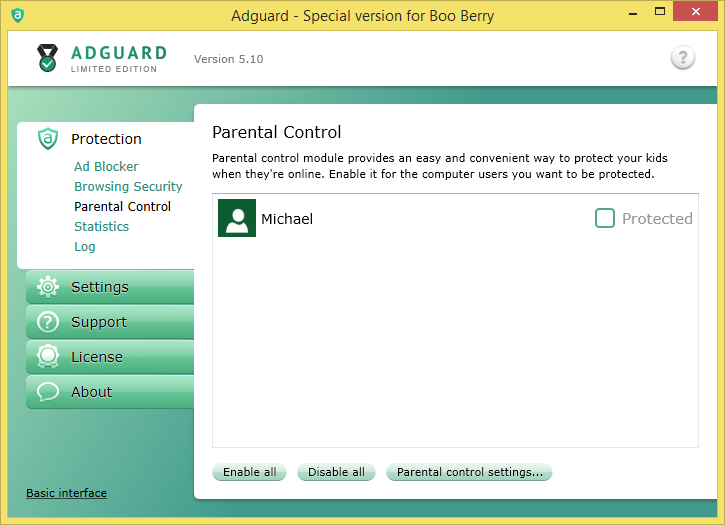 I downloaded AdGuard and I wonder if the license is needed to use AdGuard. Can you use AdGuard and expect it to work without a license? After a 14 day trial, yes, you'd need to purchase a license to continue using Adguard. I have the adguard extension added to my primary browser; Firefox. It seems to work well, as good if not better than adblock plus. I also installed the Windows PC version 5.10. Why do I need the PC license or even have it running on windows? but what benefits would I have by keeping and purchase either the basic or premium license? Adguard extension have exception like Internet Explorer. There is no extension for IE. So, if anybody who loves only IE , will need full Adguard App to be installed on the device. and for that you need license after 14 days of trial. If you love Firefox , then there is extension available, and no need to install full app. Extensions for web browsers are free. ahhh thanks it is very definitive!!! It does appear that I will license it soon I am impressed with all the AdGuard products so will be registering!!! However, not really interested in "parental control" at 67 years old ... there is little that offends me that is new!! Fortunately, you can easily disable it - I have. LOL good to know!!!! Now i will license it for sure!! Actually was on the fence .... but not now!!!! Indeed, it's as simple as unchecking the box! Did not know about that. Perhaps I will. Thanks!! *nowadays obviously needed PC disclaimer: I did not mean to hurt the feelings of elder ppl nor anyones. I also apologize to have not differed between elder male and elder female beings (as well as elder asexual, nonsexual, ...) beings. Also I am sorry not to have taken your color into account. Thanks for clarification ... now I know at least ONE member of this site lacks credibility! Maybe AG should not even sell a license to an obvious idiot! edit: BTW: before getting "politically incorrect" (what you already did) just get to know the bloody meaning of smileys! edit2: about "credibility": When a credible man recognizes that an obvious idiot did not get the idea then he, as a honorious man, informs the idiot. The latter one feels offended though (though being handled as an honorable guy (worth being informed). Obviously! Name calling and disrespect of other forum members will NOT be tolerated. I'm closing this topic now.